A compilation of inspiration and diversity, a fresh and honest perspective of modern life circumstances, with refreshing comparisons to parts of life that never change. Howard Parchment immigrated to Canada from Jamaica in the spring of 1990. 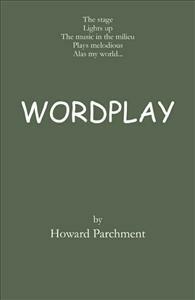 His sizzling Caribbean roots along with his North American influence is eminent in his first publication, 'Word Play'. Howard is now commencing his major in psychology and has a strong background in studying drama. In this first book, Howard depicts the 'ups and downs' of his life. Watching other poets express their words on stage inspired Howard use poetry to manifest his own thoughts and feelings. congrats howard, these poems you present is a great introduction placing your poems and yourself in your biographical and historical contexts. keep up the good work we are proud of you. The thing that I like most about "Wordplay" is the fact that it is young and fresh. Howard's poems were a pleasure to read and easy to relate to. One of my favorite poems is "I Believe". I have read it about 10 times and every time I read it gives me strength to face whatever problems life throws in my way.